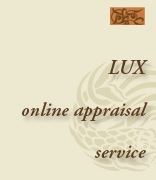 Lux Appraisers regularly prepares Appraisals, based on photographs and descriptions for informational, casualty insurance and equable distribution purposes. Appraisals prepared for Internal Revenue Service purposes are selectively accepted, based on the type of property in question. Generally, items which have a “brand name” designation such as Lalique, Royal Doulton, LLadro, Hummels and other collectibles are good candidates for on-line Appraisals. Most 19th century furniture can be valued by photo. The more esoteric an item is, the more difficult it will be to properly evaluate without personal examination. Quality of finishes on early furniture, nature of glazes on Asian ceramics and other nuances may not be discernable by photograph. Please feel free to forward an image for our review. We will conduct an Appraisal for you, if we can properly serve you. Each object will be thoroughly described and will include origin, condition, dimensions provenance and Replacement, Market or Fair Market Valuation. The final document will be prepared in hard copy and forwarded via U.S. Mail. Please include any pertinent information with your image. You may also mail photographs to our offices. Our fee is $125.00 per item.